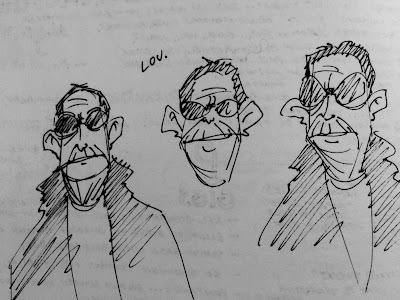 Scribble Junkies: Lou Reed ink sketches.. Here's a quick design sketch I did of Lou Reed for the Blank on Blank series. I always use ink in my sketchbook, it's a trick I use to keep my drawings quick, and build a habit of committing to your lines. I wrote an entry about using ink a while ago here. Lou was fun to draw because of the curious lines in his face.. and his floppy ears. His leather jacket collar created a nice framing element for his under bite jaw. I love the first stage of production, when I can just sit with my sketchbook, draw designs and come up with ideas for shots. Since we wrap each episode in about a week, this part of the process only lasts a half day or so. And here's the final episode from PBS Digital, it was published a few months ago, and is possibly my favorite of the last dozen or so that we've produced.